AirJamz: Play Real Air Guitar Pick at Brookstone—Buy Now! 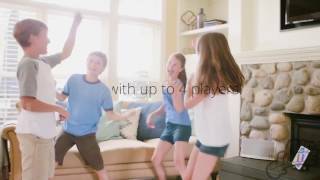 AirJamz: The App-Enabled Music Toy. Play Air Guitar and Make Real Music with Your Motion! Instant fun for the whole family. AirJamz is an app-enabled bluetooth guitar pick that has everyone making music.. Simply power up, connect to the AirJamz Music app on your mobile device and strum, shake or move. Your motion is sensed and instantly turned into music and sounds in the app. Now your moves make music! It’s shaped like a guitar pick, but AirJamz goes way beyond rocking guitar riffs. With over 100 instruments & sounds, there’s something for everyone: drums, keyboards, DJ scratches, movie “like” sound effects; all played on top of exhilarating backing tracks.. If you like music, musical games or karaoke, you’ll love AirJamz – it will get everyone off the couch and the whole house rocking! Works with Jamstik SmartGuitars. Jamstik SmartGuitars not included. Q: What is AirJamz & Who is it for? A: AirJamz is a wireless, "Air-Guitar" that makes it easy for anyone to play real guitar sounds & feel like a rockstar. It's recommended for kids ages 6 to 60. Q: What Devices Work With AirJamz? A: Most Newer iOS & Android Phones & Tablets Are Supported! Q: I am having issues connecting to my device, what should I do? A: First, ensure bluetooth is turned on in the settings menu of your device. Make sure your AirJamz is properly powered on. In this state, the LED should be blinking green. Refer to the above list for compatibility. Unfortunately, AirJamz will not pair with iPad 2, iPhone 3 or earlier as they do not support BLE bluetooth connectivity. Q: How Long Does the Battery Last, and How Do I Replace it? A: AirJamz comes with a standard replaceable CR2032 3V coin battery and will last for 12-15 hours of active playtime (longer in standby mode). One will be included in your purchase. Replacements can be bought at most major electronics and retail stores, or ordered online. We recommend using a small coin to unscrew the battery compartment. Install the battery with the, "+" side facing out.